I am delighted that the lovely Emma Mitchell of super famous ‘Silver Pebble‘ fame has agreed to pen a guest post for Higgledy. I am rather taken by her writing and am hoping she will be available for more writing in the new year. We are getting close to 1/4 of a million readers a year now and I can’t consistently submit the poor creatures to my warbling without at least some respite. I have included Emma’s bio at the end of the post. Wildflower meadows are quite the thing. They’re as covetable as a red leather satchel, Saltwater sandals or James off last year’s Great British Bake Off’s fair isle jumpers. 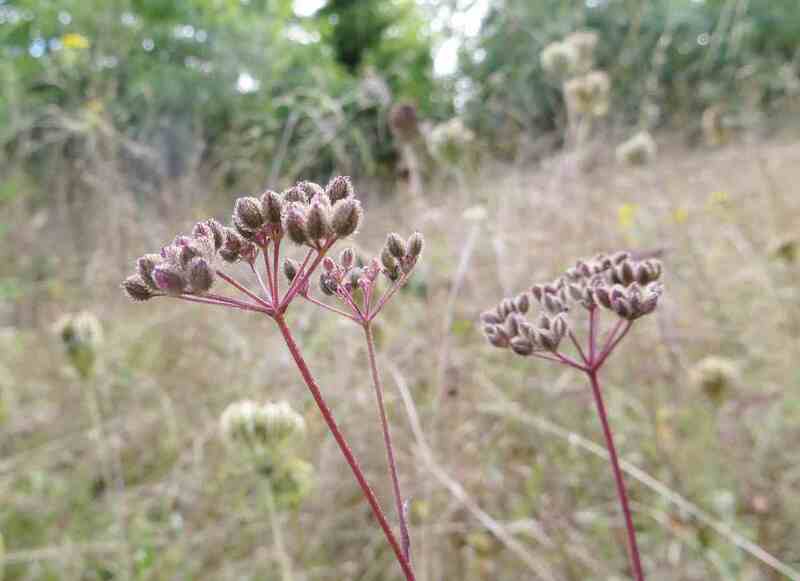 Just about now the seeds of many wildflowers are perfectly ripe and fall onto the soil, stick to the fur of a passing weasel to be taken down a leafy lane or are scoffed by a birdy to be, ahem, dropped onto next door’s Ford Cortina or even better, into their garden. Many annual wildflower species such as cornflowers and poppies capitalise on the remaining mild weather and germinate in the next few weeks. 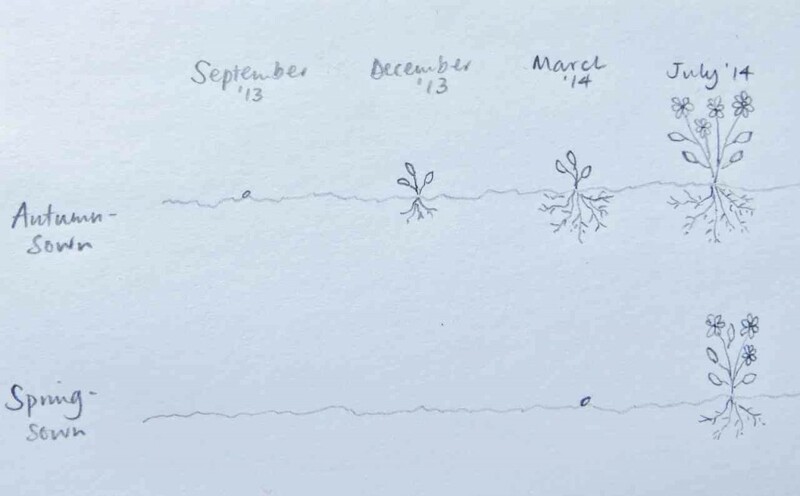 The resulting seedlings are fairly small and once the cold weather hits the leaves go into suspended animation. Crucially though, their roots continue to develop beneath the soil and provided the little plants don’t fall foul of Peter Rabbit’s gnashers the strong root balls they have formed during winter ensure that they are primed and ready to grow away in March. This natural Autumn sowing is an insurance policy against a miserable, soggy, scowl-inducingly cold Spring, such as the one we endured in 2013 and taking a leaf (sorry) out of the wild annual flowers’ book seems a wise thing to do. Although strong hardy annual plants can be direct sown from March onwards, an autumn-sown annual is much more likely to be able to withstand late snows and frosts. Not only that they’re bigger, lustier and produce more flowers. In May and June the fireworks begin from autumn-sown plants and plug the gap between the last tulips and the first flowering perennials and Spring-sown seeds. That secret winter root ball is a marvellous thing. 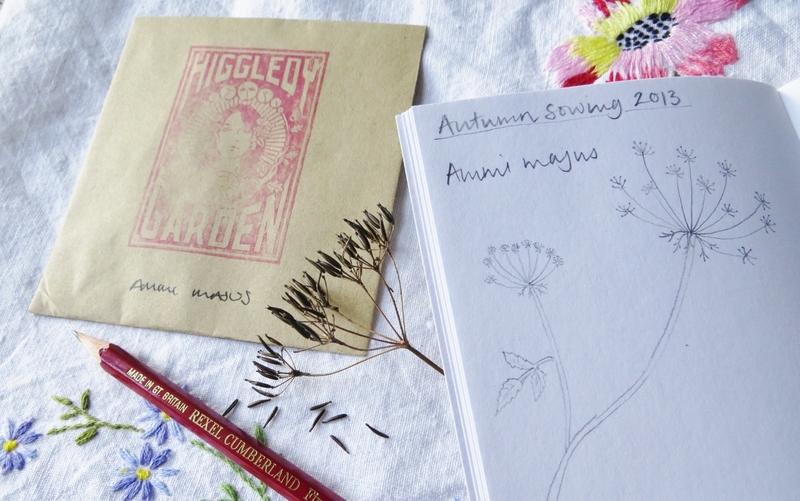 Higgledy Garden Ammi Majus are £1.95 for 1000ish seeds. My very favourite wildflowers are umbellifers: those exquisitely lacy, frothy, hedge-edgy, woodland favourites of hover flies: cow parsley, hogweed, pignut and wild carrot. They’re like tiny upside down flowery umbrellas. I have seen bees shelter under them during rain showers (I am serious – this happens on the Devil’s Dyke here is Cambridgeshire). They may be humble but they’re v. chic just now and are bona fide design muses- take a gander at Sanderson’s mid century-inspired fabric design‘dandelion clocks’ or Lucienne Day’s 1950s print ‘Calyx’. Angie Lewin weaves them into her mesmerisingly beautiful botanical prints. 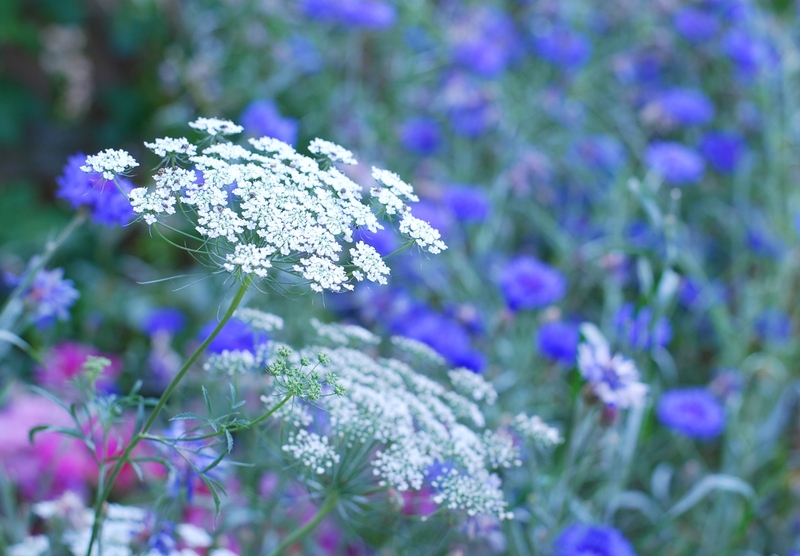 This year though I discovered a new member of this stupendous group of umbellifer flowers: Ammi Majus. As mind-bogglingly lacy and fractal-like as a vintage doily: check. A perfect pincushion for Mrs Tiggywinkle: check. So chic that it was all over Chelsea and Hampton Court 2013: CHECK. Ammi Majus loitering about at Higgledy. Seriously, I have spent an embarrasingly long time gazing at Ammi majus flowers and sighing this summer. It is perfect for autumn sowing. Combined with eschscholzia, marigolds, cosmos, scabiosa and cornflowers it would form a meadow-like flowery cutting patch worthy of an advert for a certain (flaky) chocolate bar or hair swishy 1980s conditioner. It’s utterly stunning on its own en masse in an enamel jug but as part of a mixed bouquet or posy it is truly the bees knees and forms a gorgeous frothy, subtly pale foil for bright colours. 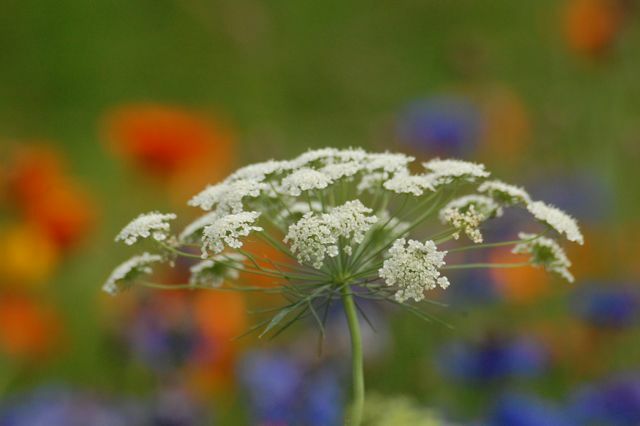 Frankly I have a massive crush on Ammi majus. It is the Steve Carell of the cutting patch: rather unassuming, yet on closer examination has devastatingly twinkly good looks. Emma lives in a tiny pink cottage on the edge of the Fens and makes things out of silver in a hut at the bottom of her garden. Her jewellery designs (mostly inspired by the flowers and plants) have been featured in Country Living magazine, in Kirstie Allsopp’s book ‘Craft’ and will shortly be available in the Cambridge Botanic Garden shop. She has written for the Guardian and Sarah Raven’s lifestyle blog. 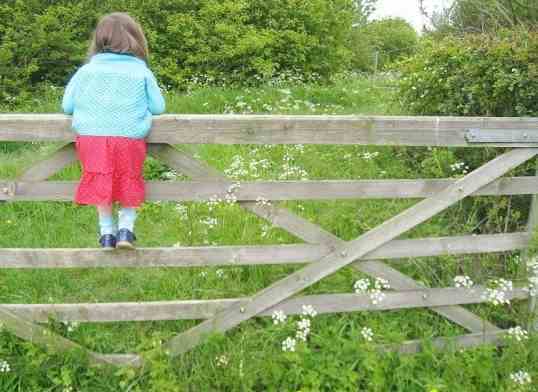 She rarely ventures out of the house without her camera, collects vintage cardigans and is a fan of hedgerow liqueurs. Phlox ‘Grandiflora Tall Mix’ From Seed. Top Five Annual Flowers of 2013! …well…according to moi. Only Emma could liken Ammi to Steve Carell – next up we’ll be calling ranunculus the minions ;-) Seriously, what a lovely post – thoroughly enjoyed it. And it reminded me to get my autumn sowing skates on before it gets colder than a cold thing round here.